On august 12, 2018, President of Turkmenistan Gurbanguly Berdimuhamedov arrived in Aktau, the Republic of Kazakhstan on a working visit to participate in the V Summit of Heads of the Caspian Littoral States. In the air harbor of Aktau, where the State flags of the participating countries were raised on flagpoles, the President of Turkmenistan was received by officials. From the airport, the Turkmen leader’s cortege headed to the venue for the Summit – Friendship Palace, where President of the Republic of Kazakhstan Nursultan Nazarbayev welcomed the President of Turkmenistan. The leaders of the two countries exchanged friendly handshakes, here they are jointly photographed. President of the Republic of Azerbaijan Ilham Aliyev, President of the Islamic Republic of Iran Hasan Rukhani and President of the Russian Federation Vladimir Putin arrived in Aktau to take part in the summit. The Heads of the littoral states headed to the Conference Hall in the Friendship Palace, where the top-level meeting was held in an extended format. The agenda included a set of priority issues relating primarily to the legal status of the Caspian Sea, the development of effective partnership in key areas such as economy, transport, ecology, security in the Caspian, and other relevant aspects of cooperation. Opening the meeting and greeting his foreign colleagues, the President of the Republic of Kazakhstan expressed his confidence that the results of the Aktau Summit would make a worthy contribution to the promotion of multifaceted cooperation in the Caspian. At the beginning of his speech, President of Turkmenistan Gurbanguly Berdimuhamedov expressed gratitude to the President of the Republic of Kazakhstan Nursultan Nazarbayev for the hospitality and the conditions created for productive work. The Turkmen leader also noted that the five-way cooperation on the Caspian Sea largely depends on our countries’ level of involvement in trade, economic and transport processes. In this regard, President Gurbanguly Berdimuhamedov thanked the Caspian states that supported Turkmenistan's initiatives put forward in the framework of the IV Caspian Summit on the elaboration of the agreements on trade and economic cooperation between the Caspian states and on cooperation in sphere of transport. President Gurbanguly Berdimuhamedov expressed belief that the first Caspian Economic Forum in 2019 will confirm the readiness of our countries to consolidate the efforts in this direction and proposed to hold this forum in Turkmenistan. In concluding his speech, President Gurbanguly Berdimuhamedov reiterated his thanks to the heads of littoral states for their enormous personal contribution to the development of good-neighborliness and cooperation in the Caspian region, for constructivism and respectfulness shown at every stage of joint work, and suggested to convene the next Caspian Summit in Turkmenistan. At the end of the five-sided summit meeting in the enlarged format, the signing ceremony of the final documents took place. To the applause of the present, the Presidents of the Republic of Azerbaijan, the Islamic Republic of Iran, the Republic of Kazakhstan, the Russian Federation and Turkmenistan put their signatures under the Convention on the Legal Status of the Caspian Sea, a historical, basic document that establishes legal norms for cooperation in the Caspian in various fields. Among other documents signed by the parties at the 5th Summit of the Heads of Caspian Littoral States are the Agreement between the Governments of the Caspian Littoral States on Trade and Economic Cooperation; the Agreement between the Governments of the Caspian Littoral States on Cooperation in the Sphere of Transport; the Agreement on the Prevention of Incidents in the Caspian Sea; the Protocol on Cooperation and Coordinated Action of Border Authorities to the Agreement on Security Cooperation in the Caspian Sea signed on 18 November 2010; the Protocol on Cooperation in Combating Terrorism in the Caspian Sea to the Agreement on Security Cooperation in the Caspian Sea signed on 18 November 2010; the Protocol on Cooperation in Combating Organized Crime in the Caspian Sea to the Agreement on Security Cooperation in the Caspian Sea signed on 18 November 2010. As a result of the 5th summit of the heads of the Caspian states, a corresponding Communiqué was also adopted. 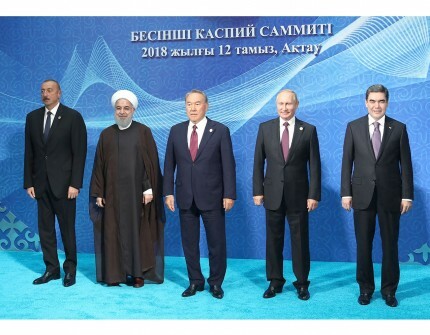 Thus, the current summit marked a real breakthrough, the beginning of a new milestone in the history of relations between the countries of the Caspian region, giving a five-sided interstate cooperation a qualitatively new impetus. At the end of the press conference, a ceremony of joint photographing of the heads of the Caspian states took place. On the same day, President of Turkmenistan Gurbanguly Berdimuhamedov held a meeting with the President of the Republic of Kazakhstan Nursultan Nazarbayev. In the afternoon, the heads of the Caspian states took part in the ceremony of launching young sturgeons in the Caspian Sea. This symbolic action has become a kind of confirmation of the commitment of coastal countries to a course on constructive partnership, one of the priorities of which is cooperation in order to ensure the ecological well-being of the Caspian Sea, rational use of its natural resources. A specially prepared theatrical performance dedicated to the Caspian theme was also offered to the attention of the heads of state. After the program of the visit was over, President of Turkmenistan Gurbanguly Berdimuhamedov proceeded to the International airport of Aktau, from where he left for his homeland.